Boarded-up homes on the 2400 block of Federal Street in Point Breeze. Philadelphia’s long distressed housing market is leading the country in one area. According to a recent analysis, Philadelphia is No. 1 in homes bought and sold for cash in 2015. “It’s been actually a phenomenal market for many years,” said Greg Yuter, the founder and CEO of Home Cash Guys, a company that buys homes in the general Philadelphia area for, as the company name says, cash. About 60 percent of the city’s homes sales in March were done with cash compared with an average of 35 percent across the country and 38 percent in Pennsylvania, the study found. No one factor fully explains the trend, but some real estate experts point to businesses buying homes in financial distress for cash and then renovating to rent them out. Other businesses might be after the property’s land to build new. Developers are rushing to meet the demand of renters who are driving demand and gentrification. CoreLogic focused on the 100 most populous metropolitan areas in the country using a three-month average starting in January to rank each city -- a time period in which Philadelphia showed a spike. Shamit Saha, a director with the real estate advisory and investment banking firm Llenrock Group, is part of this development. He started investing in Philadelphia real estate in 2009. “We had a few single-family homes we bought -- I’m not gong to call it whimsically, but trial and error -- with another group,” Saha said. In 2012 and 2013, Saha could buy some of the homes for $30,000 to $40,000, which could be renovated for around $20,000 and then rented. It was an inexpensive process. The purchase of properties in financial distress is not the only explanation for a city having a high rate of cash sales. High-income earners, for example, who have a lot of money on hand might purchase a home without having to take out a mortgage. “The other missing piece of the puzzle is young first-time home buyers,” said Kevin Gillen, an economist at the University of Pennsylvania. Many young people who might otherwise purchase a home with a mortgage are instead saddled with student debt, for example, and stuck in the rental market. This leaves more room for other buyers more likely to pay cash. And some of the data is difficult to fully explain. While Philadelphia’s cash home sale rate is consistently above the national average, there was a major spike in January where the rate jumped to 61 percent from 46 percent in December. This jump pushed Philadelphia to lead the country. Molly Boesel, a senior economist with CoreLogic, could not explain what caused the spike, but said home sales can be seasonal and there has already been a small decrease in March. “From here I would expect it to decrease,” Boesel said. Last year, the rate decreased somewhat as summer approached. Signs of the booming cash home sale business are visible throughout the city’s changing neighborhoods. Signs are plastered on old buildings and posted on telephone poles, often printed in a style similar to yard signs, advertising that by calling a number, a resident can sell their home for cash. Other companies advertise online that they will buy your property. “There are a lot of neighborhoods that are turning over,” said Yuter. His company Home Cash Guys predominately advertises online and sells the purchased properties to other investors. Allan Domb, president of the Greater Philadelphia Association of Realtors, said consumers need to be careful in this market and wary of speculators trying to quickly flip properties. He said even if the property owner needs money fast, they should check with a realtor to make sure any offer is fair. “Be very cautious,” Domb said. In general, however, Domb said Philadelphia’s developers are taking advantages of opportunities to expand into new areas of the city. And Philadelphia’s comparatively lower property values are an asset. “Philadelphia isn't as expensive as Washington D.C. or San Francisco,” said Adam DeSanctis, an economic issues media manager with the National Association of Realtors. Buyers swoop in hoping that property values rise, he said. In addition to low property values, Saha said the quality of the tenant in Philadelphia was important. 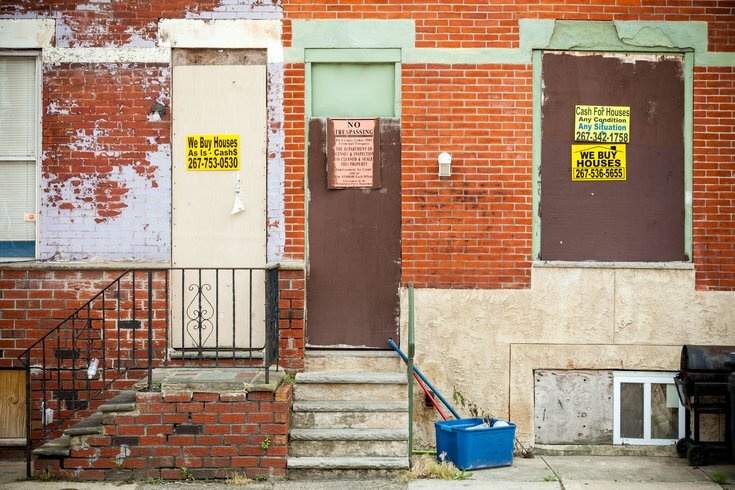 “If you look at Philadelphia, when you get someone who is paying $850 [a month], you have to have your head on your shoulders to a certain extent,” Saha said, adding that this meant that owners were less likely to be stuck with delinquent renters. There are real estate taxes that must be paid but overall, the expenses in Philadelphia were pretty good -- property taxes were often low enough for the deals to make sense, said Saha. It’s hard to predict how long the market will last. Perry GraBois owns Jag One Properties LLC, which focuses on developing Point Breeze. He said that while the market is still good, the properties that gave developers high profits with little effort are harder to find. "Everybody now is jumping into the game," said GraBois.